Shammai (50 B.C.E. – 30 C.E.) was a famous Jewish scholar of the first century C.E., and an important figure in Judaism's core work of early rabbinic literature, the Mishnah. He was the most eminent contemporary and opponent of Hillel, taking a strict position on the interpretation of Jewish law versus Hillel's more liberal interpretation on many matters. Both teachers were part of the movement known as the Pharisees, who sought to increase piety among the Jewish people by emphasizing the application of the Law of Moses in everyday life, rather than insisting mainly on the priest-centered tradition of the Temple of Jerusalem. Shammai's school became known as the House of Shammai (Beit Shammai), and Hillel's was known as the House of Hillel (Beit Hillel). The debates between these two schools of Jewish thought grew particularly bitter in the period leading up to the Jewish rebellion against Roman rule (66-73 C.E.) that resulted in the destruction of the Temple and the death of countless Jews. They also form the basis for many of the discussions recorded in the Talmud. Shammai's views also indirectly shaped early Christianity, in which Jesus appears to side with the school of Hillel on most matters, sometimes strongly denouncing the strict legalism that characterized the followers of Shammai. Shammai was likely a Palestinian Jew. His family was relatively well off, and he was an engineer by trade. A man of an irascible temperament, he adhered to the "letter of the law" in most cases, believing it was the responsibility of Jews to uphold the Torah absolutely. A famous story characterizing him tells of a time when a Gentile came to him and asked to be converted to Judaism upon the condition that Shammai summarize the entire Torah while standing on one leg. Shammai took offense at the request, and he drove the applicant away with his measuring stick. Hillel, on the other hand, did as the seeker requested by summarizing all of "the Law and the Prophets" with the famous dictum: "What is hateful to you, do not unto your neighbor." (Shabbat, 31a). It would be a mistake, however, to consider Shammai as a misanthrope. He appears to have recognized that his temper was a liability and recommended a friendly attitude toward all. His motto was: "Make the study of the Torah your chief occupation; speak little, but accomplish much; and receive every man with a friendly countenance" (Avoth, i. 15). While he upheld the Law with unbending firmness, he was reportedly modest in his personal style and evidenced humility even toward his young pupils. 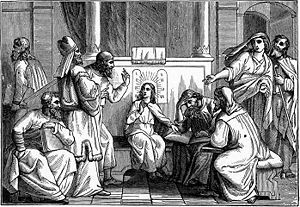 During Shammai's lifetime, the governing council of the Jews, or Sanhedrin, was influenced by the Pharisees, to which both he and Hillel belonged. Hillel served as the council's president. Shammai became vice-president after Menahem the Essene resigned that office. Then, after Hillel died, around in 20 C.E., Shammai took his place as president, with no vice-president from the minority being elected. The school of Shammai thus attained complete ascendancy, enabling Shammai to pass his "18 ordinances" in conformity with his ideas. 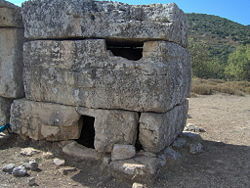 The tomb of Shammai in the Meron river in Israel. The exact content of Shammai's ordinances is not known, but evidence suggests that they were designed to strengthen Jewish identity by insisting on stringent separation between Jews and Gentiles, an approach that was regarded as divisive and even inhuman by the followers of Hillel. Gamaliel, Hillel's grandson, held the position of Sanhedrin president around the year 30. Nevertheless, the Sanhedrin would remain primarily dominated by the House of Shammai until after 70 C.E. After that time, the House of Shammai rapidly lost influence (see below). During rabbinical debates at Jamnia in the late first century, a "voice from heaven" is said to have nullified the legality of Shammai's rulings and those of his followers (Berakhot, 1:7). Rabbinical Judaism from then on would, for the most part, follow Hillel. In the years following the death of the two great teachers, disputes among their disciples increased to such an extent as to give rise to the saying, "The one Law has become two laws" (Tosef., Hag. 2:9; Sanh. 88b; Sotah 47b). According to the Jewish Encyclopedia, some 316 controversies between these two schools are preserved in the pages of the Talmud. However, the Shammaites did not always take the "strict" view on every issue. Indeed, in 55 of the 316 cases, they took the more lenient position. Sometimes a "strict" view on one issue led to a "liberal view" on another. For example, Shammai's strict view on the question of divorce led his disciples to a more liberal view regarding the legally acceptable behavior of wives. However, the Shammaites were said to have inherited, and even to intentionally imitate, the stern and unbending character of their founder. To them it seemed impossible to be too stringent in applying the Law. They were also intensely patriotic, refusing to submit to foreign rule. They opposed all friendly relations not only with the Romans themselves, but also with those Jews who cooperated with the Roman administration. The House of Shammai particularly abhorred both the Roman tax system and the Jewish collaborators who served as tax collectors. Under the leadership of Zealot Judas the Galilean and a Shammaite named Zadok (Tosef., Eduy. ii. 2; Yeb. 15b), a popular political movement arose to oppose, even violently, the practice of the Roman laws. The Hillelites, animated by a more tolerant and peaceful spirit, consequently lost influence. Feelings between the two schools grew so hostile that they even refused to worship together. As the struggle intensified, the Shammaites attempted to prevent all communication between Jews and Gentiles, prohibiting Jews even from buying food from their Gentile neighbors. The Hillelites opposed such extreme exclusiveness. However, in the Sanhedrin, the Shammaites, together with the Zealots, carried the day. Thus, the struggle between Shammai and Hillel forms an important historical background to the first Jewish rebellion against Rome and ultimately to the destruction of the Temple of Jerusalem. The House of Shammai and the House of Hillel continued their disputes even after the demise of the Temple, probably until the reorganization of the Sanhedrin under the presidency of Gamaliel II around 80 C.E. By that time all hopes for victory over Rome had been lost, and the House of Shammai was obliged to take a subservient role. Formerly disputed legal points were brought up for review and in nearly every case the opinion of the Hillelites prevailed (Tosef., Yeb. i. 13; Yer. Ber. i. 3b). Few of the leading figures of the two houses during this period are known. The Talmud names two leaders of the House of Hillel: Jonathan ben Uzziel and Johanan ben Zakkai. Three leaders of the Shammaites are also mentioned by name: Baba ben Buṭa (Bezah 20a), Dositai of Kefar Yetma ('Orlah 2:5), and Zadok (Tosef., 'Eduy. 2:2). However, these three are mentioned mainly because, they represented a faction of the House of Shammai that sometimes supported the Hillelite position. Jesus among the teachers. Shammai and Hillel were probably both alive and active at the time. The debate between the followers of Shammai and Hillel also formed part of the background to the story of early Christianity. When Jesus, at the age of 12, was found by his parents in deep discussion with the teachers at the Temple, (Luke 2) it is possible that Shammai or Hillel—and certainly some of their close disciples—were among them. Jesus appears to have sided with the House of Hillel on many matters, from commerce with Gentiles to the degree of strictness he insisted on with regard to the kosher dietary laws. Indeed, Jesus' famous saying, "do unto others as you would have them do unto you" (Luke 6:31) appears to be a paraphrase of Hillel's own summary of the Torah (see above). Likewise, Jesus' willingness to compress "the Law and the Prophets" into short summary teachings such as "Love the Lord your God with all your heart and... love your neighbor as yourself" (Mt. 22:32-36) place him firmly in the camp of Hillel. We may even speculate that the Pharisees whom Jesus excoriated as "blind guides" and "hypocrites" (Mt. 23) were followers of Shammai, who would be prone to find fault with Jesus' teachings. Meanwhile, other Pharisees, such as Nicodemus, protected Jesus from persecution in the Sandhedrin (John 7:50-51). Joseph of Aramithea, who provided Jesus with his tomb and was a secret disciple (John 19:38), was reportedly a prominent Sanhedrin member (Mark 15:43). After Jesus' death, his early followers, too, seemed to fall into both camps. The "Judaizers," who insisted that non-Jewish believers be circumcised before being accepted into full Christian fellowship, echo the attitude of Shammai, whose followers refused fellowship with non-Jews. On the other hand, Saint Paul's teaching that Jewish and Gentile Christians should sit together as brothers seems more in accord with teachings of Hillel, (Gal. 2:11-13) even surpassing Hillel in liberality. In this regard, Paul's statement that he was taught by Gamaliel, Hillel's grandson, is particularly interesting (Acts 22:3). Gamaliel himself is portrayed as eloquently defending the rights of Jewish Christians in the Sanhedrin (Acts 5:33-39). During the period prior to the Jewish rebellion against Rome, Shammai-type Jews would have been likely to harshly reject and even persecute Jewish Christians, both for their liberal attitude toward Gentiles and their willingness to "render unto Caesar" (Mark 12:17). Jesus' reputed association with "tax collectors and sinners" (Matthew 11:19) would have been particularly offensive to Shammai's disciples. Reports of Jewish Christians being punished by local Jewish councils (Matthew 10:17) may be best understood with reference to the dominance of the House of Shammai in Jewish politics of the time. This page was last modified on 11 September 2015, at 15:08.